These Silencers fit only to regular Dog Tags. Do not order them for Mini Dog Tags! 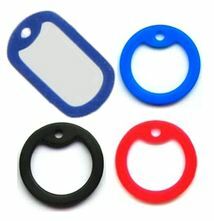 Dog Tag Silencer, DTS01,is made from flexible colored silicon and can beï attached to dog tags to improve comfort and mobility. Another benefit of the silencer is realized in hot climates or during summer, when stainless steel may heat on open sun. Each dog tag requires its own silencer. The picture below shows silencers in a round shape. This is a shape in the free state. After the silencers are stretched over edges of dog tags they take the form of the dog tag. We currently offer the products in three colors: black, red and blue. *Colors may slightly vary from those shown on the picture. For complete offering of Medical Id Dog Tags , please, refer to this page.